Annie Laura Hodgson was born about 1897, daughter of Edgar Hodgson. On 18 December 1920, Annie, married John William Cunningham, aged 23, son of John William Cunningham and Mary Teresa Case, in Congregational Manse in Wallaroo, South Australia . Louise Victoria Roehrich was born on 7 September 1903 in Orroroo, South Australia , daughter of Joseph Frederick William Roehrich and Gertrude Alice Brooks. On 3 April 1926, Louise, aged 22, married Cecil Joseph Cunningham, aged 25, son of John William Cunningham and Mary Teresa Case, in St Paul's Church in Orroroo, South Australia . [S2] Birth Registrations, S.A. Births 1907-1928, Book 201A/Page 285. Gertrude Alice Brooks was born on 10 June 1872 in Gepps Cross, South Australia . Paul Hoffmann was born on 7 November 1864 in Hill River, South Australia . Paul was also known as Paul Hoffman. 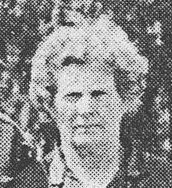 Monica Florence Perry was born on 12 February 1900 in Bute, South Australia , daughter of John James Perry and Mary Miller. On 25 January 1922, Monica, aged 21, married George Thomas Case, aged 26, son of Emmanuel William Case and Mary Jane Quinn, in St Mary's Catholic Church in Wallaroo, South Australia . About 1888, John, married Mary Miller. Mary Miller was born about 1866. About 1888, Mary, married John James Perry, son of James Douglas Perry and Susan Wauhop. Clarice Wilma Oehms was born on 20 May 1906 in Kadina, South Australia , daughter of Francis Arthur Oehms and Lilian Elizabeth Harvey.